We awoke to a dry camp this morning of which we were pleasantly surprised, however, the mornings have turned cold. It’s getting more difficult each morning to get out of the warm sleeping bag. We have started putting our clothes at the bottom of our sleeping bags to keep them warm and dry…again. Jackets, hats and gloves are at the ready and are becoming part of the morning uniform now, and will probably be that way through to Canada. We know that Fall in the Northwest mountains comes earlier than it does for us on the beaches of SoCal. In fact, it feels like the beginning of Fall, and we are beginning to feel a sense of urgency as well. We set off all bundled up and by 9 am ominous thunder claps begin to rumble overhead. 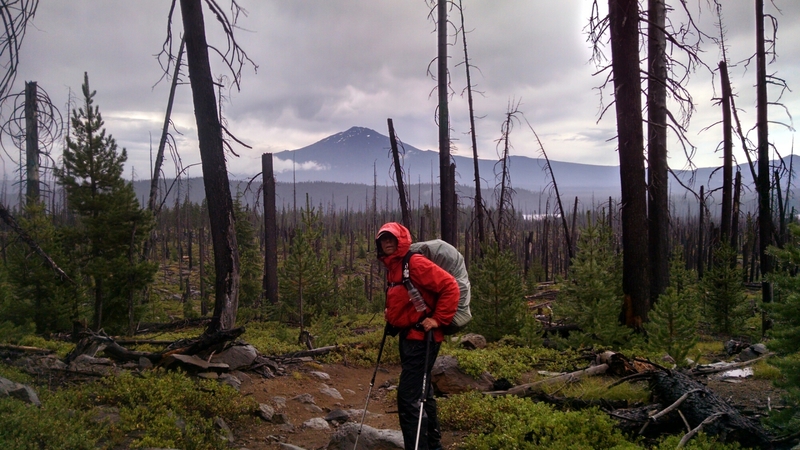 We, in turn, grumble about whether to dawn the rain gear and pack covers or wait it out. It seems we always suit up too early and sweat until we can’t take any more, then off it comes and we repeat the exercise again. We walk on as the thunder seems to be closing in and the cadence begins to quicken. Seeing it’s daylight, it is hard to tell if lightning is accompanying the raucous thunder. We felt a sudden drop in the air temperature along with strong gusts of wind and knew all too well that rain was inevitable. Within minutes the sky darkens to that of almost twilight, and the deluge begins. 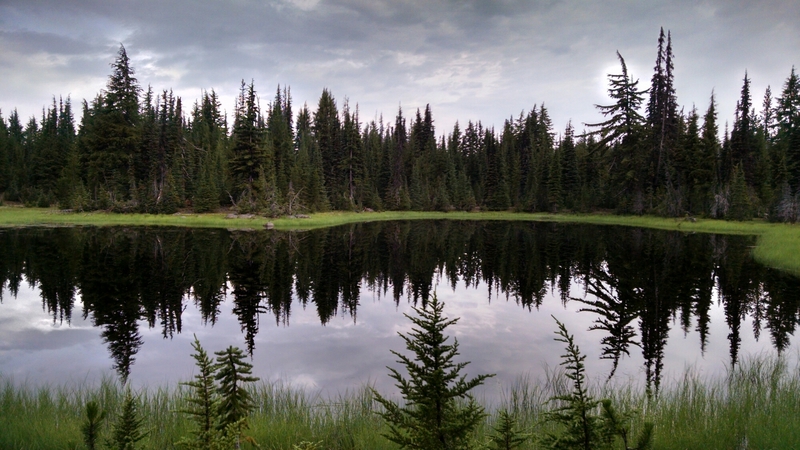 We stopped under some tall wide pines and dawned our rain gear, each hoping that the tree we were changing at was not on the immediate list to be struck…at least while we were under it. Bright flashes followed by loud crashing thunder directly over head. It feels as though the earth is trembling beneath us. We begin to count, one one thousand, two one thousand, and so on to determine the distance, but when it becomes near simultaneous, we duck together as if it helps avoid being struck. A few “holy shits ! !” were muttered before we moved on. It seemed best at the time to get the heck out there as the storm was over head. Moving quicker than normal (yes I have two speeds when I need too) we quickly cover ground, round a corner and come to a screeching stop. Just ahead we see two trees on fire 10 feet off the trail. Lighting strikes! Instant pucker factor times 10. Thank goodness my “second speed” is still really not that fast. At the base of these trees were two blazing campfire size fires that were beginning to spread. We went to the base of the trees and worked to extinguish the fires using our trekking poles to disperse the burning debris. When we left, the bases of the trees were no longer actively burning, but now smoldering in the continuing rain. Overhead however, was another story as there were still several branches high above that were burning from the lightning strike. We hoped that the rain would put them out before they dropped onto the ground below. The air all around us was rich with the smell of smoke, as we continued on, still moving at a quickened pace. We were unsure if the smoke was from the fire we had reduced and attempted to extinguish, or from additional fires nearby. Either way, we were determined to keep motoring and hopefully walk our way out of this storm cell. Eventually the rain and its audio-visual display dissipated, which allowed us to remove our rain gear, but not before becoming nearly drenched in sweat. 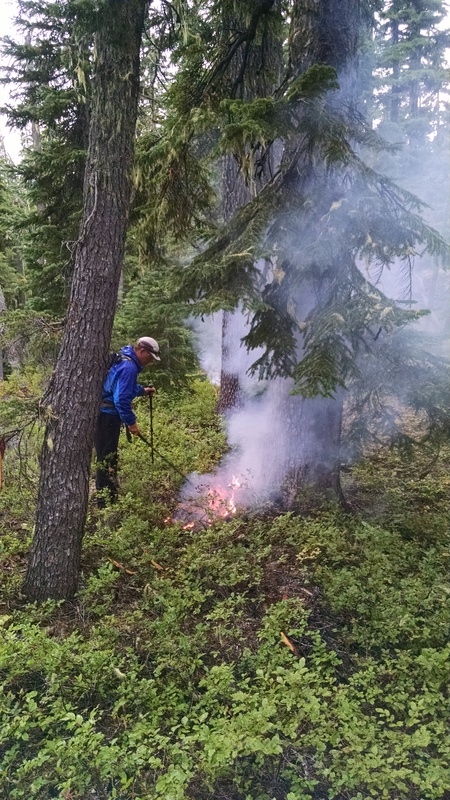 The dense forest then opened up into the sparse terrain of a “recent” (5 years or less) burn area. Thousands of trees pale and barkless often devoid of their tops stood scattered across a nearby mountain top that stretched into and alongside the trail. Downed trees lay on either side of the trail like a giant’s interrupted game of pick-up sticks. Colorful flowers filled the space between the fallen trees and turned an apparent wasteland into a work of art. New saplings, crowded closely together, have begun to emerge from the scorched earth. The forest grew taller and thicker as we walked. We reached a small stream and decided it was time to water up for the evening and next morning. While collecting our water we were surprised to see the German couple, “Princess” and “Mr. Sandals” walk up. We figured they were way ahead of us. They ask us how we faired in the rain, and exclaim that this is the first rain they’ve had to endure… lucky them. We discuss whether to camp at the prefab campsites at the stream or chance moving on and getting caught in another downpour. We decide to take our chances seeing there was at least another two hours of daylight and it was still raining lightly. Maybe we could hike out of the rain. The rain was annoying, but we were prepared with rain gear, pack covers and a sturdy tent. Princess and Mr. Sandals expressed concern over the fact they had no pack covers and a somewhat leaky tent they have “sealed” more that once, yet they chose to continue on as we did and roll the dice as well. Several miles down the trail, Princess and Mr. Sandals pulled off to set up camp under some trees as the rain had nearly stopped. As our legs were feeling unusually good, and quite honestly the terrain had been fairly flat most of the day, so we decided to continue. 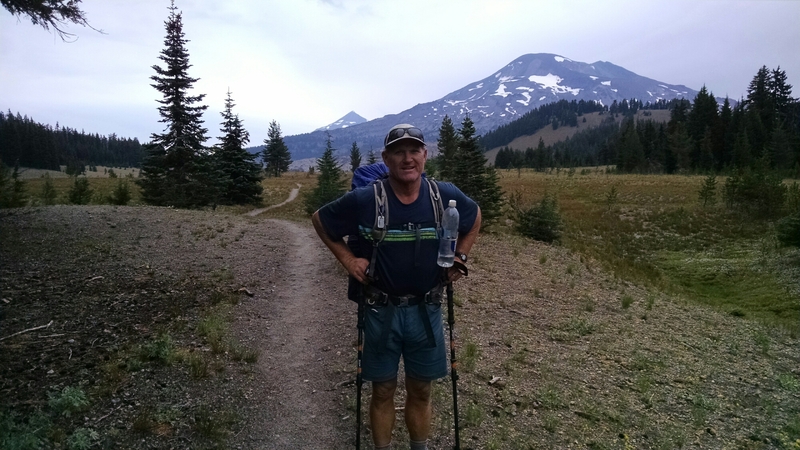 We made it another few miles and camped just past the Elk Lake second trail head and were treated to our first views full views of the Three Sisters mountains.